Categories: Building Owners, Contractors, Contractors News. Keywords: energy efficiency, LEED. “My building is just too old, energy upgrades aren’t worth it for me” is no longer an excuse: Carnegie Hall has just secured LEED Silver certification. At almost 125 years of age, this New York icon is a shining example of how every building, new or old, can utilize energy efficiency technology. In addition to the infrastructure improvements, building automation, low flow plumbing installs, security upgrades, and fire and life safety systems upgrades, the Hall has also tapped into some of its existing architecture for additional boosts. The rooftop now has reflective pavers and plantings, which reduce the building’s carbon footprint. Additionally, the 450 original upper floor windows have been utilized to maximize natural light, reducing the need for additional lighting. Categories: Latest News. Keywords: energy efficiency, energy management. Building owners are increasingly embracing energy efficiency technologies as a way to improve their bottom line by reducing their energy and operational costs, while simultaneously reducing their carbon footprint. In a recent analysis by Deloitte, the big four firm indicated that building managers’ views on energy generation have matured and “may be past the point of no return” after seeing firsthand the tremendous benefits that installing energy efficiency equipment can have on bottom lines. Of the sampled businesses, 79% view reducing electricity costs as critical to maintaining a “competitive advantage,” and many have instituted formal energy reduction goals. Additionally, cost cutting was cited as a motivation for 59% of respondents, and more than 55% of businesses now generate energy on-site. According to Deloitte, owners are increasingly controlling their own energy eco-systems through instituting better management controls, demand side efficiencies, batteries, and renewable power and cogeneration. A management decision to install energy efficient equipment is relatively easy to make compared to whether to invest in more costly on-site generation. Reducing energy and operating expenses through energy efficiency upgrades can provide a relatively quick payback. Retrofitting a commercial building with LED lighting for $400,000, for example, could yield a two year payback and save $200,000 a year in operating expenses. Energy efficiency however encompasses a much wider spectrum of options. These include upgrades and replacements of existing and aging facilities such as boilers and chillers, installing control, automation and building management systems, electrical system upgrades, weatherization, advanced HVAC, air handling systems and/or central plants. Categories: Building Owners, Energy Management, Energy Management News, Latest News, News, Tenants. Keywords: energy efficiency, energy management, IMT. Nearly five years ago the large-scale energy efficiency renovation of the Empire State Building in New York City captured the imagination of both energy efficiency advocates and the building industry. The $1 billion project was projected to save 38 percent of the iconic building’s energy and $4.4 million in energy costs annually. The first three years of monitoring and verification of the installed energy efficiency measures, however, indicate that the project is already tracking ahead of those targets. A flagship project that garnered noteworthy attention across the country, the success of the Empire State Building’s energy efficiency retrofit invited others to replicate the significant energy cost savings—which was, in fact, one of the project’s main goals. In the years that have followed, many large-scale energy efficiency retrofits have been completed or are now underway across the U.S., and this market is only expected to grow. Much of the attention around these retrofits, however, has been focused on Class A offices in a central business district, hospitals, and other large public buildings. This could lead some investors and building owners to conclude that energy efficiency retrofits are only economically viable in these building types, given their size, market presence, and access to funding and technical expertise—and that these efforts may not be as worthwhile in other buildings types, which make up the majority of the country’s existing building stock. Valuing Energy Efficiency, a new package of case studies from the Institute for Market Transformation (IMT), breaks down this misconception by examining the financial outlay and impact of energy efficient retrofits on a range of building types across the U.S., to show that building owners do not need a billion dollar budget or a large floorplan to reap all the benefits of energy efficiency. The six buildings presented—including affordable multifamily housing, Class B office buildings, small manufacturing plants, and an old university laboratory—represent the true depth of existing buildings across America. This summary paper provides an overview of the six projects highilghted in this new case study series. Categories: Building Owners, Building Owners News, Energy Management. Keywords: energy efficiency, Green Leasing, Tenant Star. Categories: Building Owners, Contractors, Energy Management News, Meters/Sensors, Water. Keywords: energy efficiency, energy management. I have been in this industry a long time and have seen a tremendous evolution of energy management over the years. The pedal is to the metal now with technology, sustainability and education moving along at a rapid pace. So in the grand scheme of things I would like to offer a personal overall perspective how I now see energy management. At the core of coarse are metering and sensor technologies along with sophisticated control devices. The IoT will allow for more points of data and control that we ever dreamed about 20 years ago. In another 10 to 20 years these points will be accessed by multiple systems and multiple users in real time. The next logical process to the view are the building management and SCADA systems that interface with these devices in order to maintain an operational balance between cost effective performance and effective human environments. Equipment failure and human intervention will cause this to go out-of-balance at some point in time. Then we introduce in solar, cogeneration, combine heat and power, wind, fuel cells, battery storage and more into the operations so now there is a different complexity to the situation. These introductions also bring the utility into the picture with policies and market programs such as Demand Response and Demand Side Management that provide revenue or savings back to the end customers and their operators. Now having said all of the above, how can we manage energy without managing the physical assets being monitored and doing the monitoring (ala, meters, sensors and relays). Maintenance systems have been around a while but I am not sure how much they have been used in the energy management process. Preventative and predictive maintenance of a facilities assets can be greatly enhanced with utility data so if there is a process why not use it and if there is not why not put one in place. Faulty controls, sensors, meters and relays can cost more in the decision making process than ignoring them. This summary can run on with much more detail but is intended only to generate some larger thoughts on energy management. 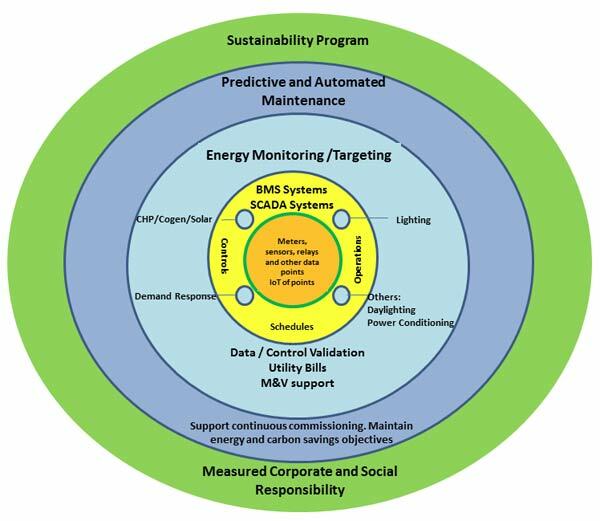 The above drawing is a clear visual of this process and shows a size and scope of what energy management can be. These circles encompass various levels of personnel and skill sets in an organization that all must be engaged to have what could true energy efficiency. How active are you or you want to be in these functional areas? Categories: Building Owners, Building Owners News, Financing, Financing News. Keywords: energy efficiency. Section 179D Tax Deduction of the IRS Code allows federal deductions for the installation of energy efficiencies in real property. Designed to incentivize sustainable building in the public and private sectors, §179D permits a tax deduction of up to $1.80 per square foot for energy-efficient upgrades to both existing buildings and new construction. Specifically, the possible maximum deduction is $.60 for lighting, $.60 for HVAC systems, and $.60 for building envelope when those systems exceed ASHRAE Standard 90.1-2001 by certain percentages. Typically, the building owner takes the deduction, but in the case of public buildings owned by local, state, or federal governments, the deduction may be allocated to the designer, such as the architect or engineer, that designed the improvements. Designers must seek certification from third party firms to ensure that their projects qualify for §179D. As an example, if a lighting system retrofit that cost $100,000 and services 100,000 square feet of commercial space exceeds the ASHRAE 2001 standards by at least 16 and 2/3 % the owner of the system may be eligible for $60,000 in federal tax deductions in the year it was put in service. The remaining $40,000 of expense would be capitalized and deducted over 39 years. In the same example, if there was a $50,000 rebate or incentive the deduction would be limited to $50,000… their out of pocket cash payment. The additional $10,000 would not be available and the lighting system would be fully depreciated in the year it was put in service. With its $1.80 per square foot tax deduction, §179D may represent significant savings for building owners and designers of energy-efficient upgrades. For example, Capital Review Group had one client that received a deduction of over $516,000 for retrofits to its 287,000 square foot auto dealership. The improvements, which included the installation of a new HVAC system, solar skylights, and LED lights, significantly enhanced both the customer experience and the building owner’s bottom line. Another CRG client, a large architectural firm, amassed nearly $7,000,000 in deductions over five years after it designed sustainable upgrades for several government buildings. Please note to take advantage of this tax saving opportunity, the energy efficient systems must have been placed in service between January 1, 2006 and December 31, 2014. Also, to claim this deduction there is no need for amending a previous year’s tax filing. Your accounting firm can simply file a Form 3115 – Application For Change In Accounting Method. Categories: Building Owners, Financing, Financing News, Latest News, Water, Water News. Keywords: energy efficiency, Multifamily, Water. In conjunction with the launch of the Green Housing Preservation Program, HDC and HPD released a rolling Green Physical Needs Assessment (GPNA) Request for Qualifications (RFQ). The RFQ aims to identify a roster of qualified firms that will perform a comprehensive assessment of buildings’ capital improvement and energy needs. The initial ten firms for the pre-qualified listwere released in early May.